Escape Pod 676: Ulissa is an Escape Pod original. 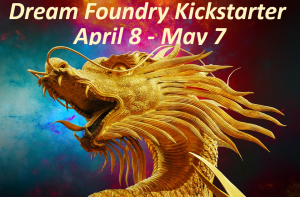 Dream Foundry’s Kickstarter is open and underway! The Dream Foundry is a registered nonprofit focused on creating a community and shared culture for all creators working in the speculative arts. We have a special focus on nurturing beginners in the field, giving them access to the information, tools, and people they need to learn, grow, and succeed in their work. Edoardo raised the binoculars. “Mio dio, it’s huge,” he said. Edoardo raised the binoculars again. Ulissa watched him closely. All morning the boy had complained that they wasted their time, and he had come reluctantly, barely obedient to his father’s command. Now, the hulking ship before them made him swallow and stare. The boy nodded, making a brave face. “Simple,” he said. Their boat—an open motorboat just five meters long with a single engine hanging off the back—jumped a wave and slapped against the next whitecap. The old woman and the boy bent their knees reflexively, riding the bounce. The old woman looked west to where black clouds bore down on a dark sea. “You’re sure no one is on that ship?” Edoardo asked. The boat jumped and the engine bit only air for a moment, shrieking. They hit the water and spray doused them all. “Ma, mio dio, it’s huge,” Edoardo repeated. Escape Pod 672: She Knits the Universe a Pink Angora Sweater (Artemis Rising) is an Escape Pod original. The Katabiotics’ erratic trajectory leaves a trail of despoiled reality, where physical laws no longer work, suns gutter and whole ecologies have never existed. So far they have cost humanity only the planet New Hope and its inhabitants, but the Katabiotics could potentially destroy the entire human sphere in the galaxy. Ordinary weaponry doesn’t work against them. There is nowhere to flee to. The economy is collapsing and people everywhere congregate in fear, pray, drink, make desperate love or kill themselves, whatever their nature tells them to. 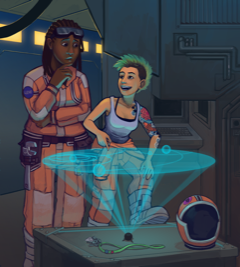 The navy needs the Oikotekts, or Cobblers as they call themselves, to repair the world when the aliens come. Escape Pod 660: Hoping for Red is an Escape Pod original. Vixen smiled and shook her antlers. She nuzzled against Doctor Fizzwinkle. All the reindeer, indeed all of the animals in the North Pole, loved the good doctor, the best veterinarian north of sixty-six degrees latitude. “Yes, and yes,” Vixen replied. “But I don’t want a normal calf!” blurted out Vixen. The Doctor smiled sadly and shook his head. Escape Pod 658: Beatrix Released is an Escape Pod original. TERMINATION SHOCK is a new roleplaying game from Greg Stolze, chronicling your adventures as an ordinary human rescued from hellish war by disorganized aliens. What will you do as a refugee in a strange cosmos? Cling to your past, or find a purpose among inscrutable aliens? Will you just get by, or will you redefine humanity in the eyes of a million extraterrestrials? The choice is yours in this new tabletop game, on Kickstarter now. The lichen in the cupboard has at last begun to sing. It sings in two-part harmony, bel canto, essaying a faultless duet with itself. What a strange and lovely fairy! I am convinced more and more that my earlier theory was correct, that the lichen is a bipartite organism comprising both fungus and an algae or bacterium. A remarkable symbiosis, distinct I believe from any recognized taxonomy. The love its halves sing to one another is profound enough to make one blush, and I soon retreated to the far end of the room to sketch my collection of English mice in the bone cabinet. Papa and Mamma have allowed me to keep a few childhood specimens in my room again, to be used for art lessons only. Dinner party tonight. All the MPs got a clinical dissection, it was lively. Papa and Grandpapa are appalled by Gladstone’s capitulation to the Irish Free Staters. I agree entirely. If it were me I’d turn them all out with a thrashing. When the guests moved to the drawing room for dessert and coffee Mamma suggested I retire, as the conversation was likely to get too intellectual for a girl like myself. Escape Pod 649: Loyalty Test is an Escape Pod original. Visit The Drabblecast Reborn on Kickstarter here. When the intercom on his desk buzzed, Marc’s head snapped up, instantly awake. He’d been dozing in his chair. His finger stabbed the button that told the boss he was on his way. He stood up and straightened his rumpled gray suit before glancing at his watch. One seventeen AM. It figures. The boss tried to cut him as much slack as he could, but humans just couldn’t keep the same pace as the Vrith, who came from the sunny side of a tidally locked planet and didn’t sleep at all. “Yes, Governor?” Marc said, even before the door to the boss’ office was fully open. Speaking before he could be seen did double duty: it showed that he was eager to be of service, as well as preventing the boss from seeing his yawn–the Vrith sometimes considered wide-open mouths a sign of aggression, and their claws could cut deep. Marc had a couple of scars on his forearms from when the previous Governor’s instincts got the better of them. It was an occupational hazard of working for the Vrith who now ran Earth’s government. Escape Pod 646: Subtle Ways Each Time is an Escape Pod original. A man loses a woman. A woman discards a man. Raised voices in a summer-boiled attic. Old records, lovingly collected, smashed up like jagged pieces of skyscraper windows. They’re in his mother’s house, gazing down at the familiar yard, the scent of peach blossoms wafting through the window. They’d played there on wobbly toddler legs, cussed out teachers as teens wearing cut-off jeans and crooked baseball caps, shared their first kiss in the shadow of the peach tree and afterward neither could say who initiated it or who was more surprised. Little fights dogged them throughout those nineteen years, but children’s minds are better at forgiving and worse at carving scars. Escape Pod 639: Me, Meg, and The Thing is an Escape Pod original.